Easter is here! Resurrection Sunday is the long-awaited day in our home where the building anticipation of the empty tomb has come to it’s climax! 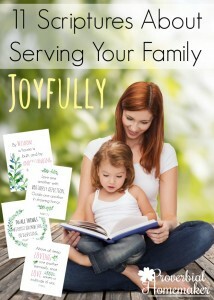 There are so many ways we enjoy this season, but it can also be overwhelming. And sometimes… the excitement dies off much sooner than we want. But the story didn’t end at the empty tomb, did it? 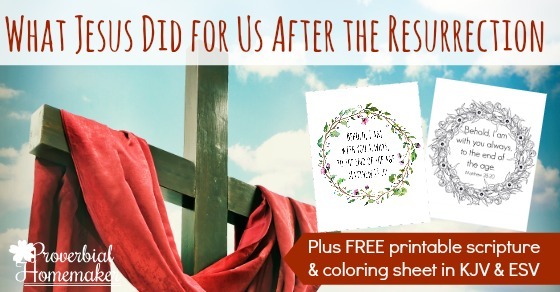 What did Jesus do for us after the resurrection? I have been thinking a lot about this the past few days. I have been in that overwhelmed place where I have allowed daily life and busy-ness to invade my peace and reflection, which I have always come to cherish in the days and weeks before Resurrection Sunday. When we get to that place, how can we find our way back? As is often the case, the answer seems to be to go back to scripture: meditating on God’s Word and character. The whole of our existence, past, present, and future, depends upon the good and perfect will of God. Jesus’ victory over sin and death is a reality all the time. The truth is, every day is Resurrection Sunday. So, our pointing to Jesus and declaring the Good News is not a one-day kind of thing. It’s an every-day kind of thing. 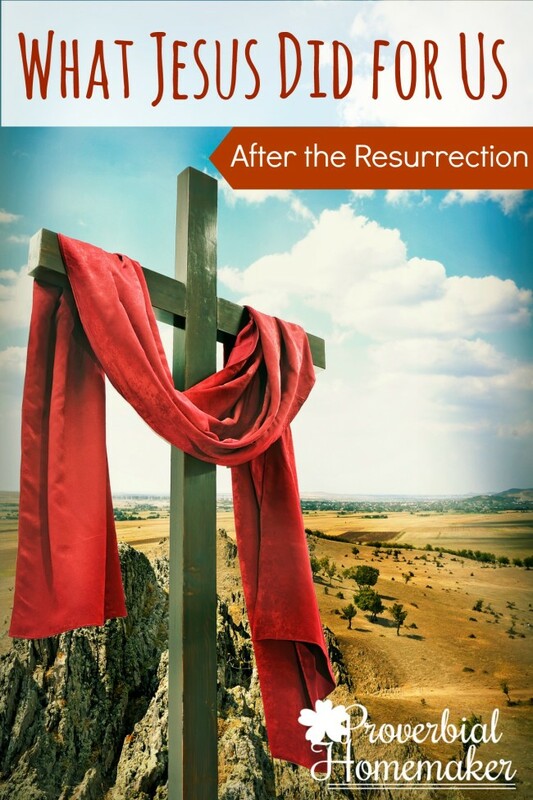 As I considered all this, and as we led our children through the real story of “Easter” in our devotions this week, I decided to take some time to more closely study what happened after the resurrection. Because with all the activity and instructing and fun… The answer to an overwhelmed heart is to run to the Rock of our salvation. What did Jesus do after the resurrection and how can we follow him there? Here is just a brief list of things I noticed, by no means exhaustive. After the resurrection, we read about how Jesus spent 40 days appearing to His disciples and instructing them before he ascended into heaven. Here’s what Jesus did for them (and us) after the resurrection. After the panic and grief of losing Jesus to such a horrible and public death, the disciples go into hiding. They are overcome with sorrow and confusion, fearing for their lives. When Jesus appears to them he comforts them, gives them courage with His words. He shows them He is, in fact, alive and not just a spirit. He replaces their doubts with faith, their sorrow with joy, and their fear with courage. Lest they (and we) forget who Jesus is, He reminds his disciples by leading them, speaking of the kingdom of God once again with authority, and explaining how Moses and the prophets were pointing to Him. He is the awaited Messiah and He has all authority on heaven and earth. Before ascending, Jesus said He would send a helper — the Holy Spirit — to transform our hearts, encourage and exhort us, remind us of God’s truth, and bear fruit in our lives, among other things. What an amazing gift! Then Jesus gives us the comfort of knowing that He won’t really be leaving. He is with us now and always. We are not alone! The disciples needed these things after the resurrection. We need them too, don’t we? We need courage and faith to face the trials of life, whether big or small. We need the reminder that Jesus is alive, He is working, and He is in control. We need to look up from our mess and see God’s goodness, glory, and grace, giving us the strength to keep following Him. Thinking on these things has brought me from overwhelmed with life to overwhelmed with Jesus. What Jesus said and did after the resurrection changed a band of fearful and sorrowful people into men and women willing to die so that others would know the Good News. How will Christ’s encouragement, authority, commandments, and faithful presence change YOU today? What is the Good News? That while we were yet sinners Jesus came to earth, lived a perfect life of faith, and died on the cross in our place. He took the punishment for our sins so that, if we repent and put our faith and trust in Him, accepting His precious gift of salvation, we are no longer condemned, but new creations in Christ. In His grace and mercy, us undeserving sinners are righteous before God because of the righteousness imparted to us by Christ. We can’t earn it. We can only receive it. We are justified, redeemed, and being sanctified every day. Because He loves us and wants to be close to us. When you stop to think about it, it really is overwhelming, isn’t it?! I know it touched my heart. In that spirit, I made this simple printable scripture for your home and mine. 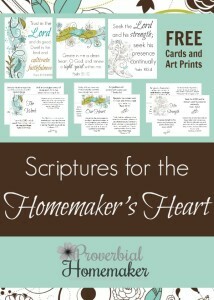 They include ESV and KJV versions as well as a coloring sheet for you or your kids. I hope you enjoy them! I hope and pray that you are blessed today as you celebrate the resurrection of our Lord. Thank you.! You have shared exactly what I am feeling. It is so encouraging to know that I am not alone in my thoughts and we are all in the walk together. I so appreciate your heart.